I have always loved Greek food. I didn't grow up eating it, I ate my first Greek food in my mid-20's. I love the freshness and the brightness of the flavors. My hubby and I have been trying to eat healthy so I'm trying out a lot of new dishes. Since he is adventurous and will eat anything I cook I'm having a blast. I picked up Cat Cora's Kitchen Cookbook for about $5 at a local discount store. It's a treasure trove of recipes, and one of our favorites is this Shrimp and Caper Salad. This recipe has all the fabulous bright flavors of the Mediterranean that I love, capers and lemon, oregano, parsley and tomatoes. It's super easy to make and rework for your own taste preferences. It's also a great dish because you can add more or less of what you like. We like more celery and capers. I also add feta cheese. This salad can be served cold, warmed or room temperature. It would be a real crowd pleaser and perfect for a luncheon or barbecue side dish. Bring a large saucepan three-fourths full of salted water to a boil over high heat. Add the shrimp and simmer until pink, about five minutes. Drain the shrimp and rinse quickly under cold water. Meanwhile in a bowl, combine the garlic, lemon juice and red pepper flakes. Add the hot shrimp to the garlic mixture and marinate for 10 minutes. In a large bowl toss together the shrimp with the marinade, the scallions, red onion, capers, celery and tomatoes. To make the dressing, in a small bowl whisk together the oregano, olive oil, salt, pepper, lemon juice and vinegar. Pour over the shrimp and vegetables. Add the parsley and toss to incorporate. Cover and refrigerate until ready to eat. Serve chilled. I cook one pound of orzo, drain it well and then put it in a very large bowl. I immediately pour the dressing over the warm orzo and mix it well. I then add the other ingredients to it. 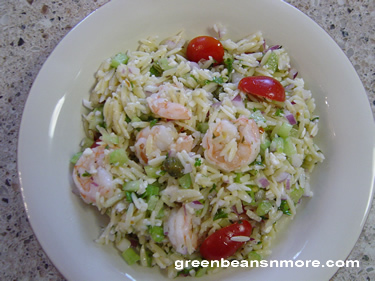 When I make this recipe with orzo I add a lot more scallions, celery, red onions, capers, etc. to bulk it up and keep it flavorful. I also find one pound of shrimp sufficient. Don't forget the crumbled feta! If you make this dish with orzo you will have to make more dressing. I make a pound of orzo and triple the dressing recipe.